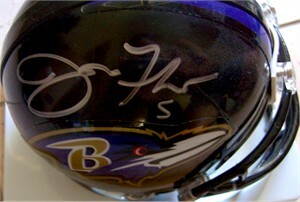 Baltimore Ravens mini helmet autographed in silver by former superstar quarterback Joe Flacco (Super Bowl 47 MVP). Obtained in person. With certificate of authenticity from AutographsForSale.com. ONLY 2 LEFT.